Complex and completely different from other thrillers, the Last Equation of Isaac Severy is highly recommended. Isaac Severy is a famous mathematician. Now retired, he is still working on his last equation: how to use chaos theory to predict Los Angeles traffic. As the book opens, Isaac is preparing a breakfast for two in his home. The next day Isaac is found dead in his hot tub along with a set of live Christmas lights with a single bulb crushed. His death is accepted as a suicide. At his funeral, his adopted granddaughter, Hazel, opens a cryptic note from Isaac mailed the day before his death. Isaac tells Hazel that he is only the first of three people soon to die. He commands her to destroy the work he left behind in a mysterious room 137 and deliver his last equation to the elusive John Raspanti. Hazel is advised to not involve other members of the family or the police. Isaac states that he selected Hazel for these tasks because she would be the least likely to be suspected. He says that he cannot do the tasks himself because he is being followed. Isaac’s note leads Hazel on a merry chase through literature, mathematics and physics. Hazel works with various family members while trying to follow the instructions in Isaac’s puzzling letter. Neither Hazel nor the reader can identify who is a hero and who is a villain. This book has a multitude of side plots. What is the elusive and wealthy P. Boone Lyons after? Why is a physicist who has been dead for sixty years attempting to contact Hazel? Ostensibly a thriller, the family dynamics are almost more intriguing. Phillip is a tenured physics professor at CalTech. However, his opportunities of winning a coveted Nobel prize are slipping away and his best years are behind him. Tom is released from a long prison term. Why was he in prison and how does that relate to Hazel and Gregory’s fear of his release? Since the family relationships are rather confusing, I created this handy family tree. Since Isaac’s work is with chaos theory, it follows that the reader truly doesn’t understand what is going on until almost the end of the book. It is reminiscent of the movie Chinatown, where there are a multitude of plot layers that don’t cohere until the end. I like that uncertainty but some may not. However, the resolution definitely is worth the wait. 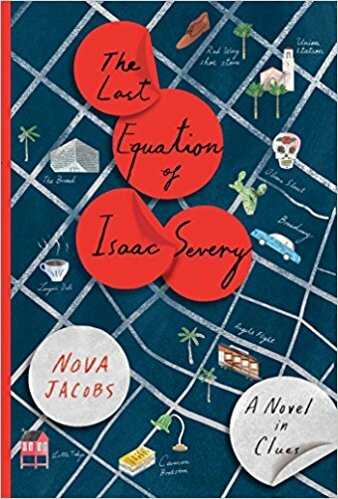 The Last Equation of Isaac Severy is a brilliant tour-de-force from a debut author. It is highly recommended to thriller readers. It would also appeal to fans of quirky family dynamics like those in movie, The Royal Tenenbaums. 5 stars! Thanks to the publisher, Touchstone Books, and NetGalley for an advanced copy. I just started reading this book and in fact created an identical family tree in Excel before I found this one. I use it as a bookmark for easy access. In the lower-left corner I have little notes: Bennet-Hazel’s boyfriend; Faye-Jane’s sister; Fritz Dornbach-Isaac’s accountant; John Rapanti-? That’s great! There is an amazing cast of characters but the book is definitely worth the extra work.